I wish you'd carry more ceramic caps outside of this kit!! The pF and nF scales are probably MLCC, also known by some as monolithic ceramics (that's what the pictures look like). Ok... 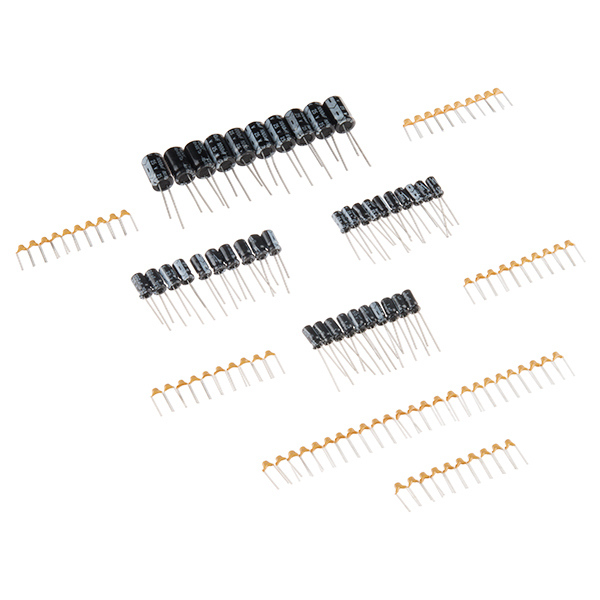 I just quickly checked DigiKey and found tantalums in the tens of nF range, the cheapest were $0.31/ea and axial. The picture caps are radial. My (generally uninformed) guess is tantalums in this size are specialty components, not something one would expect in a generic kit such as this. If you are set on tantalum, then you could take your chances with a grab bag. Jameco also has a kit that goes down to 100nF. However this Sparkfun kit is a good general purpose ceramic and electrolytic kit with a nice balance between price, number of components and capacitance range. Next time I'm $6.95 (or less) from "free shipping", this is a real candidate for getting me there! Three words: "do the math". OK, I suppose that some folks do find it easier to "guess" than to "do the math". That being said: If you are one to "do the math", kits like this are great when you don't want to wait for delivery for an "unforeseen" project (and don't want to make the trip and/or pay the price at RS, Fry's Electronics, or other "local" vendors). I was going to ask if the sticker could be included in the box (instead of pasted to the outside of the box as shown in the new product video). This would allow the sticker to be put on the divided bin that the caps would eventually be put into for organization. But, I see you provide the sticker image as a pdf and I have a bunch of label paper sitting under my printer. Thanx. Yep, you have options. Also, each value has its own little baggy so you can just leave them all in the box for those without spare bins. I want to see someone blow it up poster size and place it on the wall! If you make a wall sized cross stitch of either the resistor chart or a capacitor chart I will personally buy you a capacitor kit! That's a lot of cross stitch! Well, your assumption of my gender is correct. But your assumption that because I'm male I've never needlepointed is wrong. I learned to cross stitch when I was young, and even designed and stitched out my own 4" x 6" sampler to put on my bedroom door. (It was my initials at the top, and the words "Don't" and "Me" with a lady bug between them... Yea, my own "don't bug me" sign.) I guess I was lucky to have grown up in a household that really didn't enforce stereotypical gender rolls. It was my father's computer, stereo, and kitchen, and my mothers sewing machine, lawn mower, and chain saw. I wholeheartedly agree with that last statement. Both SparkFun and Adafruit giving air-time to women doing electronics projects (not just electronics, but also all of the other mechanical stuff to deploy said electronics) hopefully helps provide good role models for the young generations. Hmmm... sorry. This thread is getting way off topic... To bring it back to topic... ... Nice sampler kit. I have a fist full of 0.1ÂµF caps, but my latest breadboard needing 0.01ÂµF caps really highlighted an issue with my parts-bin that this kit would go a long way to resolve. Will have to add it to my next order. The Capacitor Kit was just what I needed in capacitors. It had a variety of capacitors, ranging from 10 picofarad to 100 microfarad. The larger capacitors are very good, and seem reliable, for cutting power supply glitches, and the smaller ones in timing circuits.on the 555. They came on time, too, which i was pleased with. Ordering wasn't too difficult, after being found on the SparkFun site. Because of this, I think this is a good buy. Product was received in a timely manor, package well and at a competitive price. Overall a good experience as is usually the case with sparkfun. Todo llegÃ³ a tiempo y en perfecto estado. Inexpensive, fun to construct, and useful. Works great. Good products and good service. I was very pleased with the service and the parts I bought. I was building a qrp labs 20m kit and was missing a 104 cap, most likely on the floor hiding under a paper dot. so I ordered the cap kit. great service and fast shipping. bookmark the site.